Rocks respond to stress in the brittle regime by forming extension fractures and shear fractures (slip surfaces). Such fractures are sharp and mechanically weak discontinuities, and thus prone to reactivation during renewed stress build-up. At least this is how non-porous and low-porosity rocks respond. In highly porous rocks and sediments, brittle deformation is expressed by related, although different, deformation structures referred to as deformation bands. Kinematic classiﬁcation of deformation bands and their relationship to fractures in low-porosity and non-porous rocks. T, thickness; D, displacement. Deformation bands are mm-thick zones of localised compaction, shear and/or dilation in deformed porous rocks. 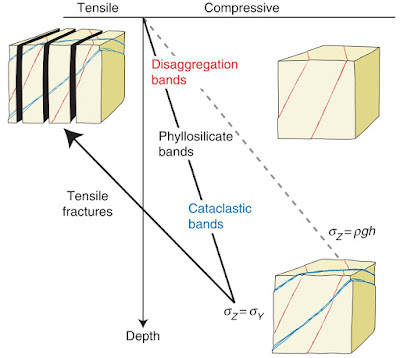 Figure above shows how deformation bands kinematically relate to fractures in non-porous and low-porosity rocks, but there are good reasons why deformation bands should be distinguished from ordinary fractures. One is that they are thicker and at the same time exhibit smaller shear displacements than regular slip surfaces of comparable length (Figure (a) below). This has led to the term tabular discontinuities, as opposed to sharp discontinuities for fractures. Another is that, while cohesion is lost or reduced across regular fractures, most deformation bands maintain or even show increased cohesion. Furthermore, there is a strong tendency for deformation bands to represent low permeability tabular objects in otherwise highly permeable rocks. This permeability reduction is related to collapse of pore space, as seen in the band from Sinai portrayed in Figure (b) below. In contrast, most regular fractures increase permeability, particularly in low-permeability and impermeable rocks. This distinction is particularly important to petroleum geologists and hydrogeologists concerned with ﬂuid ﬂow in reservoir rocks. The strain hardening that occurs during the formation of many deformation bands also makes them different from fractures, which are associated with softening. (a) Cataclastic deformation band in porous Navajo Sandstone. The thickness of the band seems to vary with grain size, and the shear offset is less than 1 cm (the coin is 1.8 cm in diameter). (b) Cataclastic deformation band in outcrop (left) and thin section (right) in the Nubian Sandstone, Sinai. 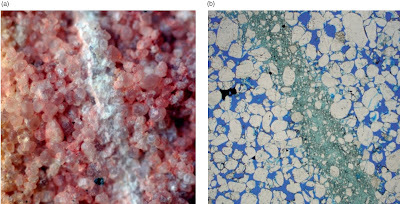 Note the extensive crushing of grains and reduction of porosity (pore space is blue in the thin section). Width of bands 1 mm. The difference between brittle fracturing of nonporous and porous rocks lies in the fact that porous rocks have a pore volume that can be utilised during grain reorganisation. The pore space allows for effective rolling and sliding of grains. Even if grains are crushed, grain fragments can be organised into nearby pore space. The kinematic freedom associated with pore space allows the special class of structures called deformation bands to form. What is a deformation band? Deformation bands are restricted to highly porous granular media, notably porous sandstone. 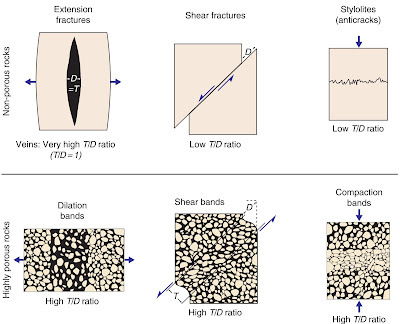 A shear deformation band is a wider zone of deformation than regular shear fractures of comparable displacement. Deformation bands do not develop large offsets. Even 100 m long deformation bands seldom have offsets in excess of a few centimetres, while shear fractures of the same length tend to show meter-scale displacement. Deformation bands occur as single structures, as clusters, or in zones associated with slip surfaces (faulted deformation bands). This is related to the way that faults form in porous rocks by faulting of deformation band zones. 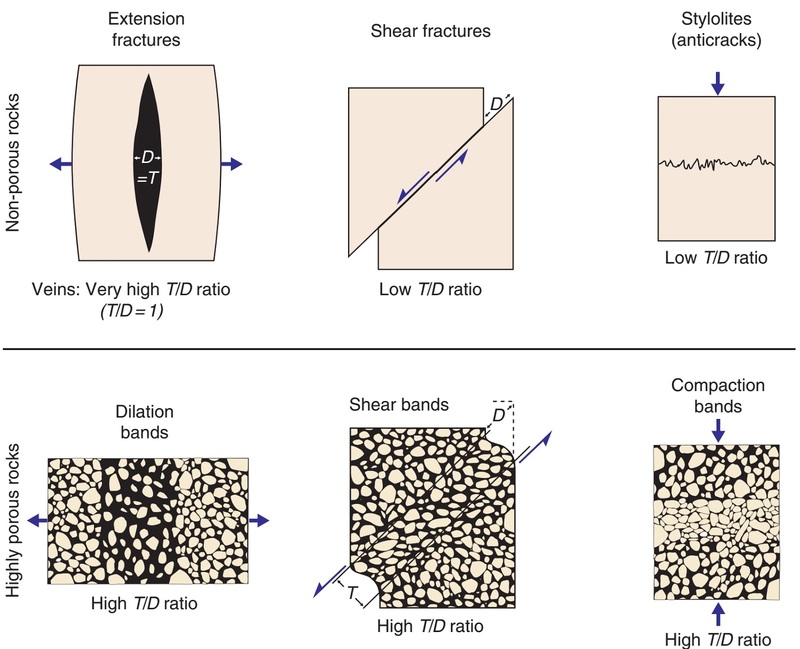 The different types of deformation bands, distinguished by dominant deformation mechanism. Deformation bands are named after their characteristic deformation mechanism, as shown in Figure above. and sediments, while cataclastic flow occurs during deformation of well-consolidated sedimentary rocks and non-porous rocks. Disaggregation bands develop by shear-related disaggregation of grains by means of grain rolling, grain boundary sliding and breaking of grain bonding cements; the process that we called particulate or granular ﬂow (Figure above a). Disaggregation bands are commonly found in sand and poorly consolidated sandstones and form the “faults” produced in most sandbox experiments. 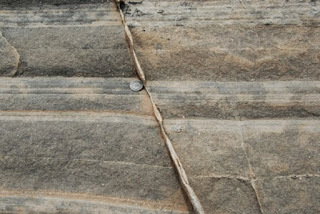 Disaggregation bands can be almost invisible in clean sandstones, but may be detected where they cross and offset laminae (Figure below). Their true offsets are typically a few centimeters and their thickness varies with grain size. Fine-grained sand(stones) develop up to 1 mm thick bands, whereas coarser-grained sand (stones) host single bands that may be at least 5 mm thick. Macroscopically, disaggregation bands are ductile shear zones where sand laminae can be traced continuously through the band. Most pure and well-sorted quartz-sand deposits are already compacted to the extent that the initial stage of shearing involves some dilation (dilation bands), although continued shear-related grain reorganization may reduce the porosity at a later point. Right-dipping compaction bands overprinting left-dipping soft-sedimentary disaggregation bands (almost invisible). The sandstone is very porous except for thin layers, where compaction bands are absent. Hence, the compaction bands only formed in very high porosity sandstone. Thin section photo shows that the compaction is assisted by dissolution and some grain fracture. Navajo Sandstone, southern Utah. minerals promote grain sliding. Clay minerals tend to mix with other mineral grains in the band while coarser phyllosilicate grains align to form a local fabric within the bands due to shear-induced rotation. Phyllosilicate bands are easy to detect, as the aligned phyllosilicates give the band a distinct color or fabric that may be reminiscent of phyllosilicate-rich laminae in the host rock. If the phyllosilicate content of the rock changes across bedding or lamina interfaces, a deformation band may change from an almost invisible disaggregation band to a phyllosilicate band. 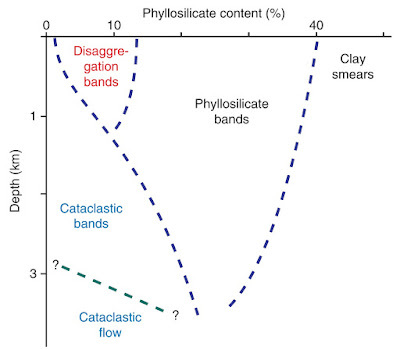 Where clay is the dominant platy mineral, the band is a ﬁne-grained, low-porosity zone that can accumulate offsets that exceed the few centimeters exhibited by other types of deformation bands. This is related to the smearing effect of the platy minerals along phyllosilicate bands that apparentlycounteracts any strain hardening resulting from interlocking of grains. If the clay content of the host rock is high enough (more than 40%), the deformation band turns into a clay smear. Clay smears typically show striations and classify as slip surfaces rather than deformation bands. Examples of deformation bands turning into clay smears as they leave sandstone layers are common. Cataclastic bands form where mechanical grain breaking is signiﬁcant (Figure b). These are the classic deformation bands ﬁrst described by Atilla Aydin from the Colorado Plateau in the western USA. He noted that many cataclastic bands consist of a central cataclastic core contained within a mantle of (usually) compacted or gently fractured grains. The core is most obvious and is characterized by grain size reduction, angular grains and signiﬁcant pore space collapse (Figure b). The crushing of grains results in extensive grain interlocking, which promotes strain hardening. Strain hardening may explain the small shear displacements observed on cataclastic deformation bands (3–4 cm). Some cataclastic bands are pure compaction bands (Figure above), while most are shear bands with some compaction across them. 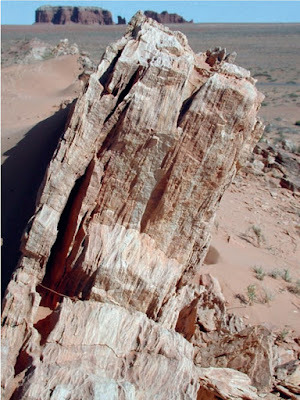 Cataclastic bands occur most frequently in sandstones that have been deformed at depths of about 1.5–3 km, although evidence of cataclasis is also reported from deformation bands deformed at shallower depths. Comparison suggests that shallowly formed cataclastic deformation bands show less intensive cataclasis than those formed at 1.5–3 km depth. 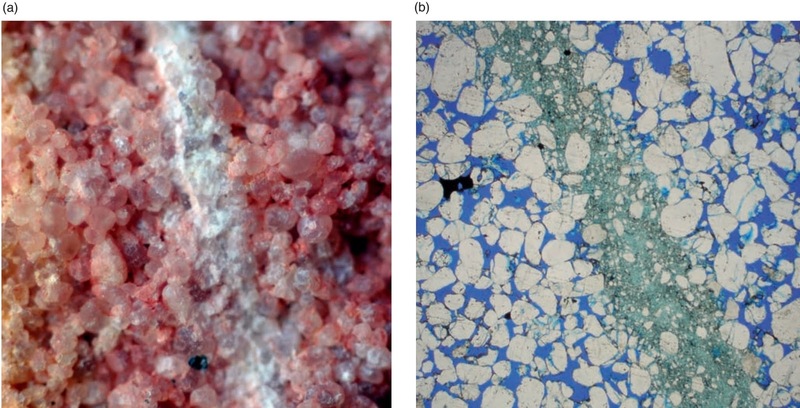 Cementation and dissolution of quartz and other minerals may occur preferentially in deformation bands where diagenetic minerals grow on the fresh surfaces formed during grain crushing and/or grain boundary sliding. Such preferential growth of quartz is generally seen in deformation bands in sandstones buried to more than 2–3 km depth (>90 C) and can occur long after the formation of the bands. Very dense cluster of cataclastic deformation bands in the Entrada Sandstone, Utah. Deformation bands form a common constituent of porous oil, gas and water reservoirs, where they occur as single bands, cluster zones or in fault damage zones. Although they are unlikely to form seals that can hold signiﬁcant hydrocarbon columns over geologic time, they can inﬂuence ﬂuid ﬂow in some cases. Their ability to do so depends on their internal permeability structure and thickness or frequency. 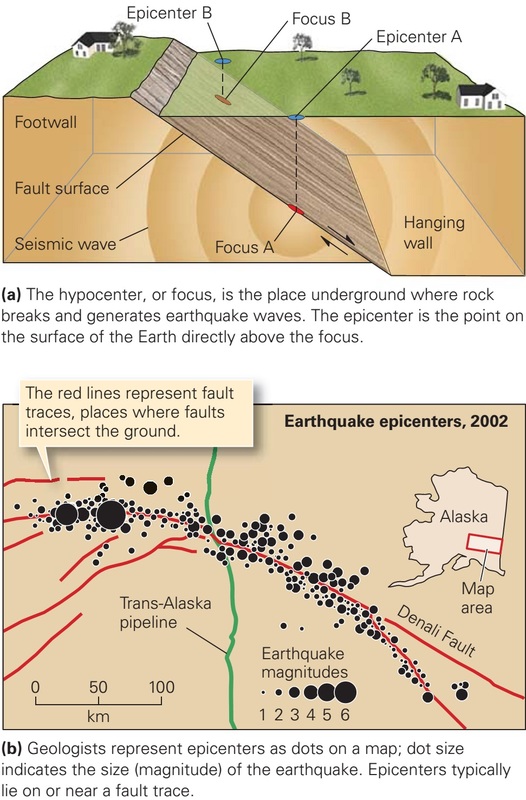 Clearly, the zone of cataclastic deformation bands shown in Figure above will have a far greater inﬂuence on ﬂuid ﬂow than the single cataclastic band shown in Figure a or b at the top. Cataclastic deformation bands show the most signiﬁcant permeability reductions. Deformation band permeability is governed by the deformation mechanisms operative during their formation, which again depends on a number of lithological and physical factors. 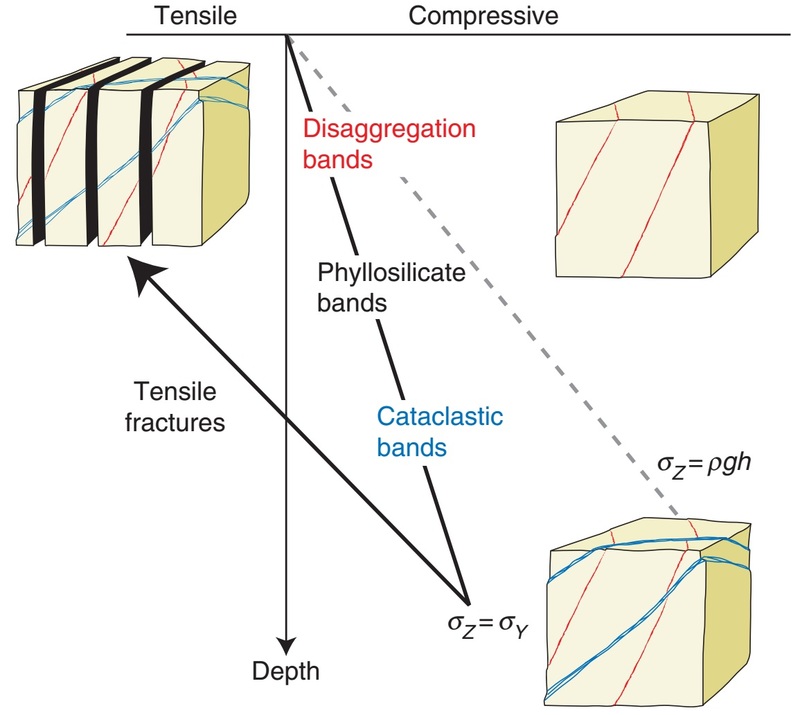 In general, disaggregation bands show little porosity and permeability reduction, while phyllosilicate and, particularly, cataclastic bands show permeability reductions up to several orders of magnitude. Deformation bands are thin, so the number of deformation bands (their cumulative thickness) is important when their role in a petroleum reservoir is to be evaluated. Conjugate (simultaneous and oppositely dipping) sets of cataclastic deformation bands in sandstone. Note the positive relief of the deformation bands due to grain crushing and cementation. The bands fade away downward into the more ﬁne-grained and less-sorted unit. Entrada Sandstone, Utah. Also important are their continuity, variation in porosity/permeability and orientation. Many show signiﬁcant variations in permeability along strike and dip due to variations in amount of cataclasis, compaction or phyllosilicate smearing. Deformation bands tend to deﬁne sets with preferred orientation (Figure above), for instance in damage zones, and this anisotropy can inﬂuence the ﬂuid ﬂow in a petroleum reservoir, for example during water injection. All of these factors make it difﬁcult to evaluate the effect of deformation bands in reservoirs, and each reservoir must be evaluated individually according to local parameters such as time and depth of deformation, burial and cementation history, mineralogy, sedimentary facies and more. The inﬂuence of deformation bands on petroleum or groundwater production depends on the permeability contrast, cumulative thickness, orientations, continuity and connectivity. What type of structure forms, where and when? Given the various types of deformation bands and their different effects on ﬂuid ﬂow, it is important to understand the underlying conditions that control when and where they form. A number of factors are inﬂuential, including burial depth, tectonic environment (state of stress) and host rock properties, such as degree of lithiﬁcation, mineralogy, grain size, sorting and grain shape. 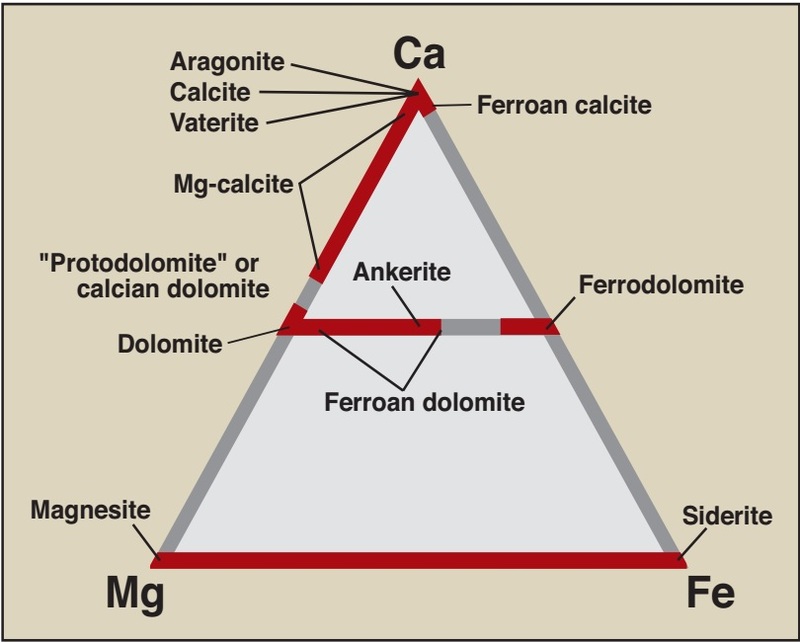 Some of these factors, particularly mineralogy, grain size, rounding, grain shape and sorting, are more or less constant for a given sedimentary rock layer. They may, however, vary from layer to layer, which is why rapid changes in deformation band development may be seen from one layer to the next. Other factors, such as porosity, permeability, conﬁning pressure, stress state and cementation, are likely to change with time. The result may be that early deformation bands are different from those formed at later stages in the same porous rock layer, for example at deeper burial depths. 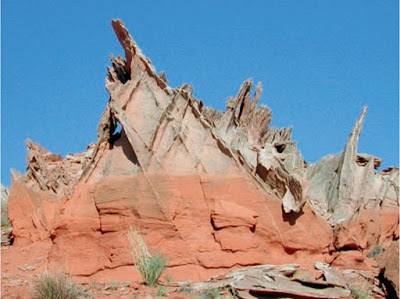 Hence, the sequence of deformation structures in a given rock layer reﬂects the physical changes that the sediment has experienced throughout its history of burial, lithiﬁcation and uplift. 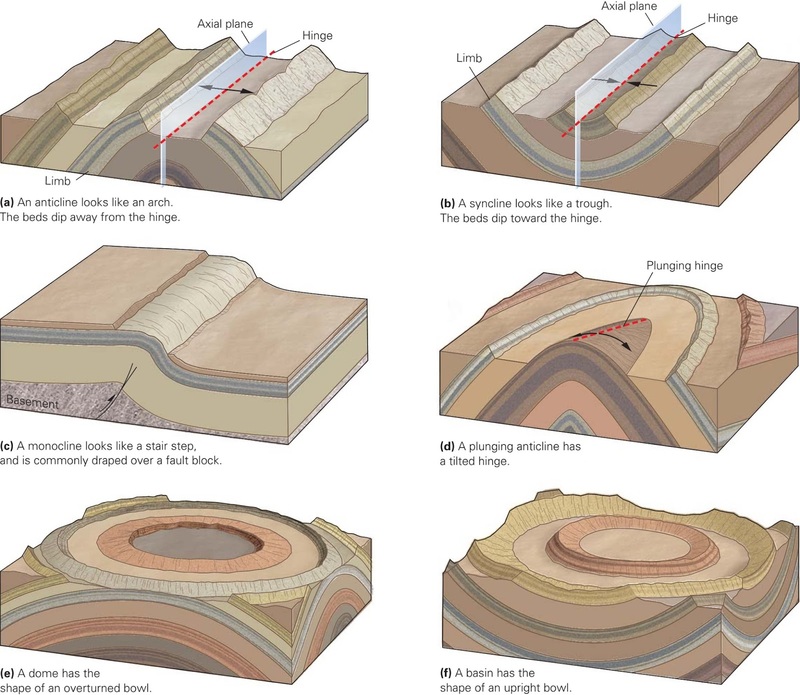 Different types of deformation bands form at different stages during burial. Extension fractures (Mode I fractures) are most likely to form during uplift. To illustrate a typical structural development of sedimentary rocks that go through burial and then uplift, we use the diagram and add characteristic structures (Figure above). The earliest forming deformation bands in sandstones are typically disaggregation bands or phyllosilicate bands. Such structures form at low conﬁning pressures (shallow burial) when forces across grain contact surfaces are low and grain bindings are weak, and are therefore indicated at shallow levels in Figures above and figure at the end. Many early disaggregation bands are related to local, gravity-controlled deformation such as local shale diapirism, underlying salt movement, gravitational sliding and glaciotectonics. other non-platy minerals with cleavage and lower hardness than quartz, and weak lithic fragments. Quartz, for instance, seldom develops transgranular fractures under low conﬁning pressure, but may fracture by ﬂaking or spalling. At deeper depths, extensive cataclasis is promoted by high grain contact stresses. Abundant examples of cataclastic deformation bands are found in the Jurassic sandstones of the Colorado Plateau, where the age relation between early disaggregation bands and later cataclastic bands is very consistent (Figure above). When a sandstone becomes cohesive and loses porosity during lithiﬁcation (left side of Figure above), deformation occurs by crack propagation instead of pore space collapse, and slip surfaces, joints and mineral-ﬁlled fractures form directly without any precursory formation of deformation bands. This is why late, overprinting structures are almost invariably slip surfaces, joints and mineral-ﬁlled fractures. Slip surfaces can also form by faulting of low-porosity deformation band zones at any burial depth. Joints and veins typically postdate both disaggregation bands and cataclastic bands in sandstones. The transition from deformation banding to jointing may occur as porosity is reduced, notably through quartz dissolution and precipitation. Since the effect of such diagenetically controlled strengthening may vary locally, deformation bands and joints may develop simultaneously in different parts of a sandstone layer, but the general pattern is deformation bands ﬁrst, then faulted deformation bands (slip surface formation) and ﬁnally joints (tensile fractures in Figure above) and perhaps faulted joints. The latest fractures in uplifted sandstones tend to form extensive and regionally mappable joint sets generated or at least inﬂuenced by removal of overburden and cooling during regional uplift. Such joints are pronounced where sandstones have been uplifted and exposed, such as on the Colorado Plateau, but are unlikely to be developed in subsurface petroleum reservoirs unexposed to signiﬁcant uplift. It therefore appears that knowing the burial/uplift history of a basin in relation to the timing of deformation events is very useful when considering the type of structures present in, say, a sandstone reservoir. Conversely, examination of the type of deformation structure present also gives information about deformation depth and other conditions at the time of deformation. Tentative illustration of how different deformation band types relate to phyllosilicate content and depth. Many other factors inﬂuence the boundaries outlined in this diagram, and the boundaries should be considered as uncertain.